Well hello there. Look, I'm still here! It's crazy how quickly one week turns into nearly a month away. But I've been really busy, truly I have! Plus I've had all the best of intentions to post, so that counts right? In fact would you believe I have 22 draft posts with images edited which just need my attention to write something. So I've been away, not just away from the computer, but like really away. In other countries away and out across the pacific ocean. The four of us, that is Mr More Nail Polish and to two kiddlie winks, went for another vacation to the south pacific islands on board another cruise. We went on a different cruise line this time, P&O Australia on their new ship, Pacific Explorer. It was the inaugural cruise for this ship under this brand, having just come out of dry dock and being refitted from being the Dawn Princess. We had such an amazing time, although the internet connection was dreadful compared to other cruise lines we've been on. We stayed in a huge suite at the aft of the ship and were treated with all the special extras that suite passengers get. I felt very special and sadly after experiencing that, there is no way I can ever go back to a regular cabin! The weather was amazingly warm and a huge contrast to the freezing (literally) weather that Canberra suffered whilst we were away. We had lots of fun dressing up for the theme nights. Bianco, where we all dressed in all white (and keeping it that way during dinner was a fun challenge for us all!). Then the Gatsby night where were wore sequined dresses and the boys were in pin striped suits and learned a dance that was performed flash mob style in the main atrium. Miss 6 got her hair done in braids (as you do when you visit the pacific islands) and we had plenty of family time together. The entertainment was exceptional, the main performers as well as the special guests because it was the inaugural cruise - magicians, mind reading mentalists, comedians as well as the usual singers and dancers. Miss 6 was crushing big time on the main lead singer and became besties with a few of the singers and dancers. The only disappointment was the very sub-par food in most of the restaurants. There were a few exceptions, but we sure were looking forward to eating something piping hot once we got home. Ok, enough about me. Let's move onto the nails. Once again I say thank you to the Digital Dozen, because it forces me to at least post 5 nail art manis for the month. You'd think that with 22 draft manis ready to post I'd have plenty I could just slip into the theme. Well no, of course not. I was going to have to create most of them from scratch. But browsing through my drafts I was able to use one of them, and then base my inspiration for the entire week on it. The theme this week is 5 Continents in 5 Days. I had originally thought of doing nail art inspired by each of those countries, something they are known for, that sort of thing. But instead I've decided to choose actual nail polish brands from 5 different continents and feature them this week. 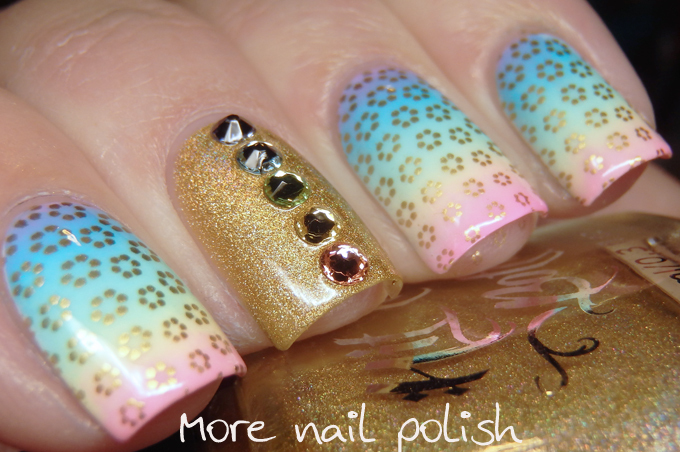 That gave me heaps of flexibility in terms of what sort of nail art I could put on my nails. Australia is my first stop, and a very easy one. Of course Australia is the only country that is also a continent, but it also happens to be the country where most of my indie polishes are from. 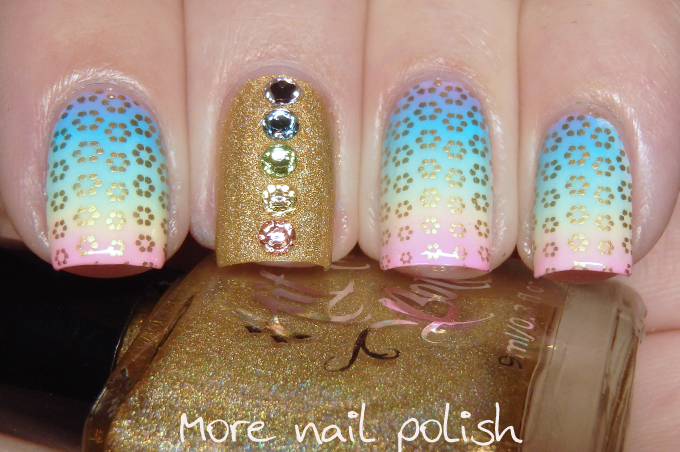 I'm featuring two Australia brands in today's mani. Pretty Serious and Hit the Bottle. 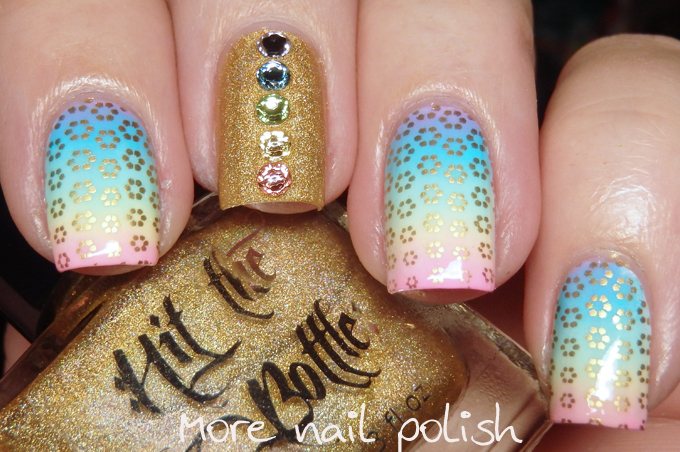 The gradient is using the perfect palette of colours from the Pretty Serious Pastel Pet names collection and the gold polish is a gold holo stamping polish from Hit the Bottle. I did find that for the very fine stamping, the gold holo polish was too faint for my liking, so while my right hand had stamping using the same gold polish from Hit the Bottle, on my left I switched it out for Mundo de Unas gold instead. Don't expect this much chit chat tomorrow, I'm now back at work and my days are generally dull and filled with meetings about deadlines and web application support, but the up side is I will be here for the next four days! Sounds like a really fun experience! 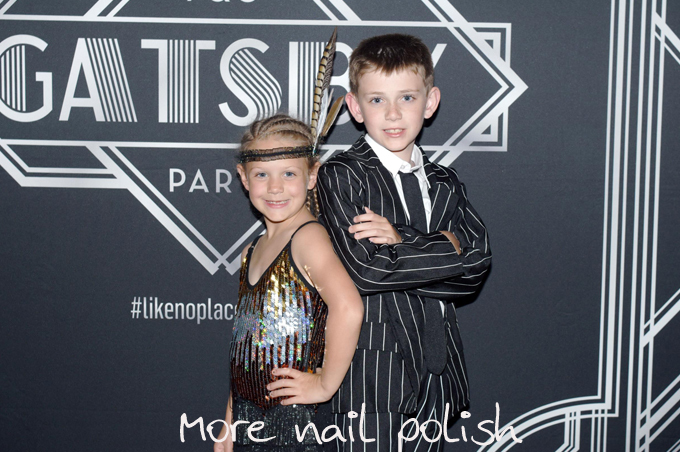 Love the nails, and your kiddos look like they had fun too! Yay for a fun vacation! 22 drafts! Wow, that's pretty amazing to me. Love these spiffy gradients. Sounds like you have had a great time! I absolutely love your mani (and that you are doing polishes from the continents). Such an awesome idea! I wish I had thought of it lol. This is gorgeous! I think I have 1 bottle of HTB & it's amazing to stamp with - perfect formula. 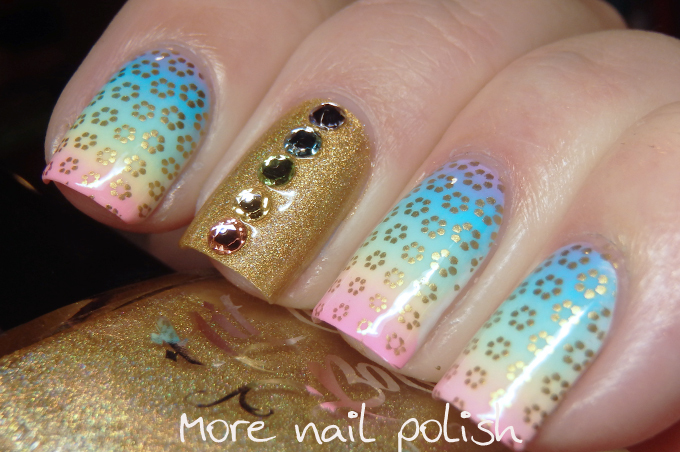 I never would have thought to pair pastels with gold, but I love this! !